London has long been a top location for filming movies, TV, fashion and advertising, so you won’t be surprise to learn that tours with a media theme are a hugely popular choice. In fact, there’s a tour for every shade of film fan, from Sherlock Holmes, Call the Midwife and Doctor Who location strolls to James Bond, Alfred Hitchcock and Gangster Movie jaunts. Outside London, you’ll find luxury guided trips to Poldark’s Cornwall, Downton Abbey Country and Inspector Morse and Lewis’ Oxford. We were invited to join current Trip Advisor favourite, the Harry Potter Tour for Muggles. The Muggles Tour is ideal for Potter movie and book devotees of any age, the proudly self- titled ‘Potterheads’. If that’s you, you’re sure to find loads to see and much to love on this 21⁄2 hour ramble, filled with fascinating facts and Harry, Ron and Hermione legends as you ‘potter’ the magical underbelly of London at a comfortable pace. Included is a short ride on the London Underground although not, we’re sad to say, on a Knight Bus or a Gringotts Wizarding Bank mine car. Adoring fans will cherish viewing the site of the Leaky Cauldron (Borough Market), alleyways which inspired magical Diagon Alley and Knockturn Alley (off Charing Cross Road), bridges under which characters flew on broomsticks (Blackfriars, Southwark) or the Death Eaters attacked (Millennium Bridge), and the spot where Mr Weasley struggled with his Oystercard (Westminster Underground Station). 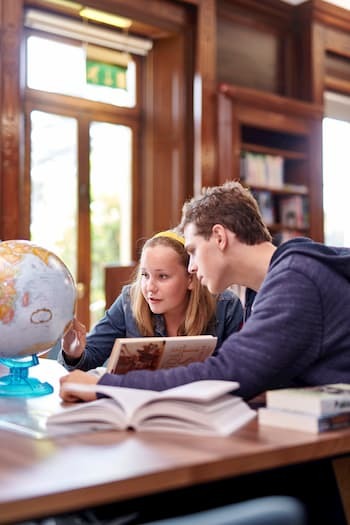 This tour is also a great way to see some of London’s most famous landmarks with Potter connections such as Big Ben, 10 Downing Street and many more. We thoroughly enjoyed our tour in the company of charming, knowledgeable and vividly-dressed guide Ellie Lovegood, (cousin of Luna) and an international group of Muggles which included Americans Matthew from Washington DC, teen Chloe and Grandma Carmella from Southern California and Allyson, Scott and son Zach from Oregon. 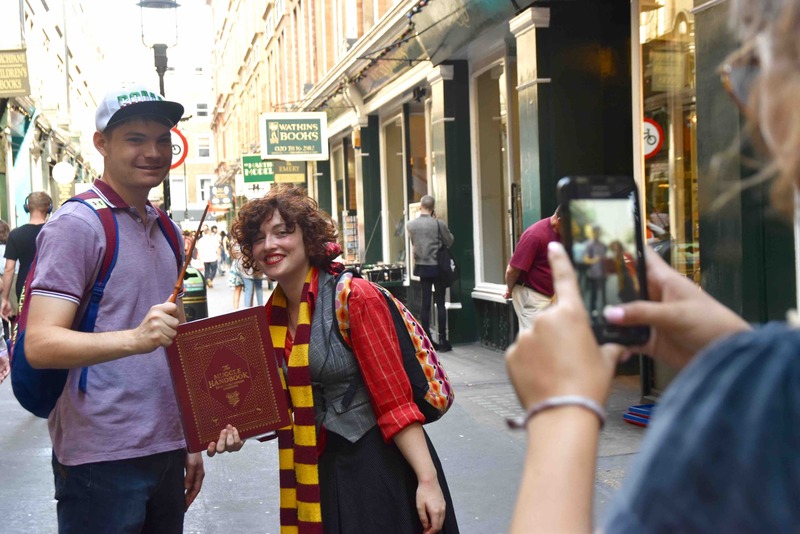 All Tour for Muggles’ guides are genuine fans. When not wizarding, serious Potterhead Ellie is a budding actress and playwright, who confessed she got the guiding job by writing a long ‘nerdy’ letter effusing why she wanted it. Dedicated followers longing for more will want to progress without delay to the Warner Brothers Studio Tour just north of London, with behind-the-scenes tours of movie sets, costumes and props from the seven films. For the ultimate treat, £99 will get you a place on the Studio’s Breakfast at Hogwarts, a deluxe dining reception complete with Cheeri-owls, Pixie Puffs, a visit to original sets like the Great Hall, the Forbidden Forest and Diagon Alley and a complimentary sample of Butterbeer. In the past I have had many amazing times at Go Ape!, swinging and climbing through trees, but when I heard that there was another option that didn’t require me to wear a harness and struggle to keep up with my kids, I was even more interested, as I am not getting any younger! This option is a Segway tour which initially didn’t appeal, but after a little thought I was more positive, and how glad was I that I went. 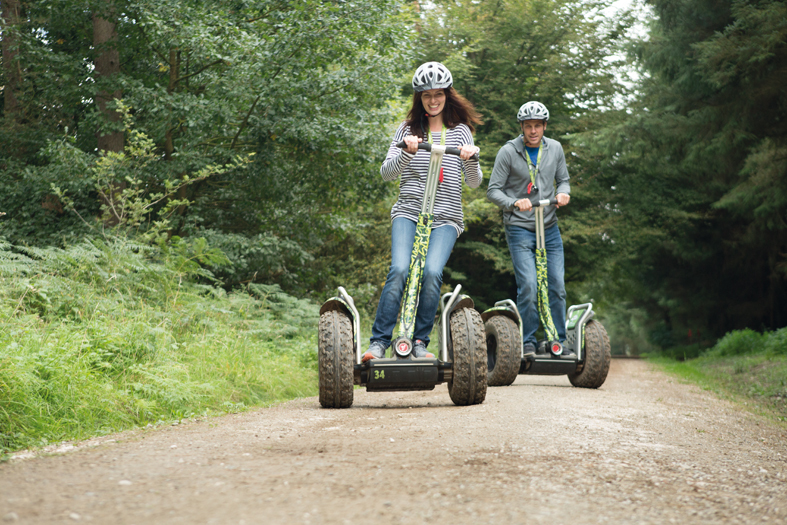 My only other exposure to segways was the one that tried to run Usain Bolt over after winning the Olympic 100m Gold, and as they were probably very experienced, my thought was what chance did I have?! Well the simple answer is, quite a lot really, as this isn’t as hard as it may appear. Once signed up, you are given a helmet and taken to a practice area where you get an initial brief lesson on how to use it, and then it’s all hands on practice. This terrified me, as I really didn’t think that I could do this, but to my amazement it really isn’t that hard, and all you have to remember is to keep your balance and legs straight and only apply pressure forwards when you want to go forward, and lean back when you want to slow down. In no time my wife, daughter and I, were whizzing around the practice area along with everyone else. Once everyone in the group was proficient, we left the practice area and segged (not sure if it is a word, but it should be) through the forest to a designated area which had 3 different routes. These routes, listed A, B and C, increased in difficulty, ranging from the relatively easy route A to the very challenging route C, and we were left to zoom around any of them practicing our new-found skills. The routes test you to the full, and my main problem was segwaying downhill as the temptation is to lean back which will just slow you down more. After about 30 minutes of zipping up and down and around challenging trails, the group all congregated again and after having our segways supped up (so they would go even faster) we started a cross country trail through the forest. This trail involved long roads (no cars) where you can get up to full speed, and although I have no idea what speed that was, it felt very fast, with the wind whistling through my helmeted hair. At the end of the hour my daughter (and to be honest I), were gutted that it was over, as we really felt like we had mastered how to use the segways and had had such fun we really wanted more. This is a great thing to do with your children, who have to be aged 10 and over, and weigh over seven and a half stone, and on our trip there were many families, all showing that children really can learn a new skill faster than their parents, and I for one had a great time. We spent an enjoyable couple of hours at Bracknell’s Go Ape!, and the staff were superb, putting safety first, although there is also a huge emphasis on enjoyment.